I've always been interested in working on a project that tries to solve a possible problem. 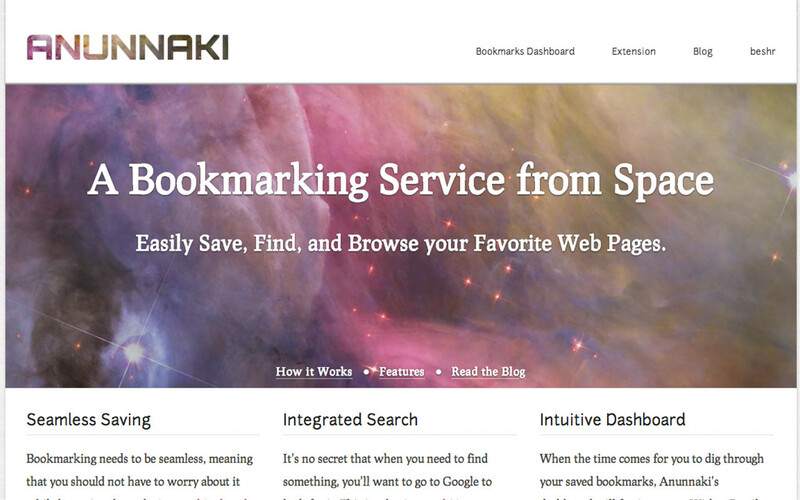 To me, bookmarking is one of the things that has always seemed to be lacking. It's like it got stuck in time and all the big guys are scared of touching it. Asking the user to enter details that -to me- aren't always necessary: Titles, descriptions, and tags are things that a system can (and should) figure out on its own without hassling the user with having to enter them (or even approve them before saving) every time a bookmark is saved. The fact that these services require taking a specific action for bookmarking is particularly frustrating as sometimes users might forget to bookmark certain web pages. Another thing is that users might not know when they need to bookmark something when they first see it. To search bookmarks users have to go to the website of the service they're using and then search, which is a bit excessive I think. I find myself searching Google when I'm trying to find something I have bookmarked before, because it's faster and much easier to access. 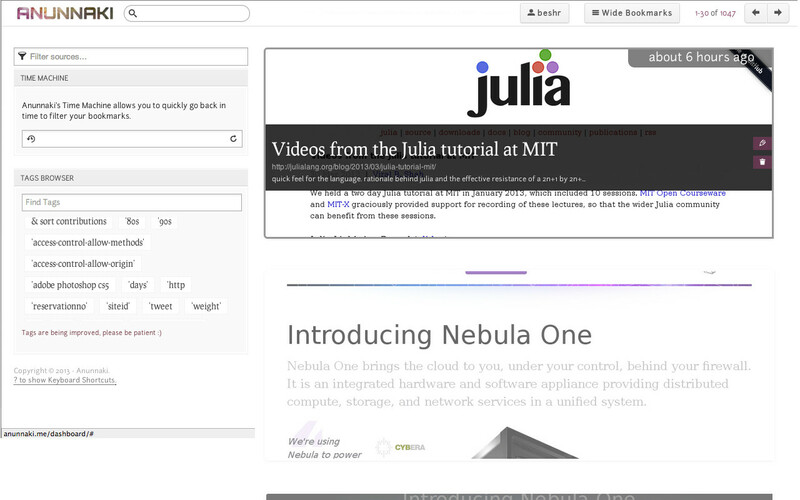 Changing the default search engine hampers the user's work flow. These are just some of the things that bothered me with bookmarking over the years, and that led me to start a new project (calling it Anunnaki for now). I'm glad to announce the alpha version in this post. 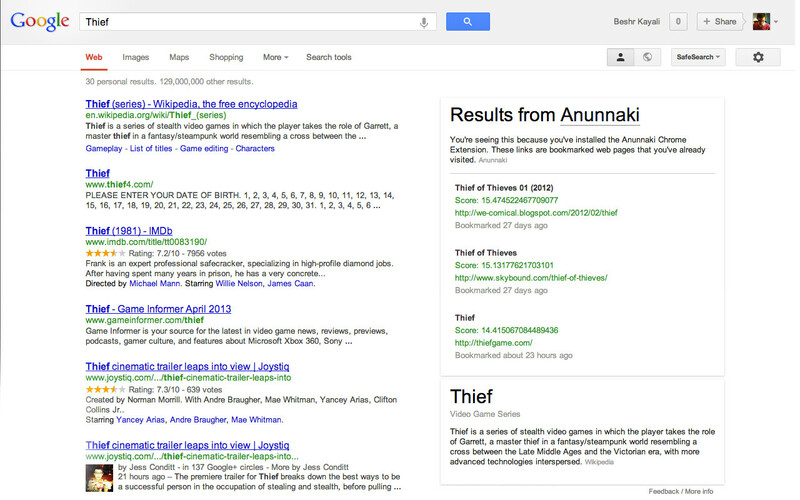 Below you can find all the information that I have about Anunnaki so far. I'm also looking for testers who are willing to try it for a while. I would love to get your feedback on how it works and if it's useful for you as it's useful for me (and 40 other alpha testers using it now). Passive Bookmarking: Automatic bookmarking based on configurable variables: time-period and/or scroll-position. Search Engine Integration: Search results from bookmarks embedded inside Google's search results page (and later on, Bing). 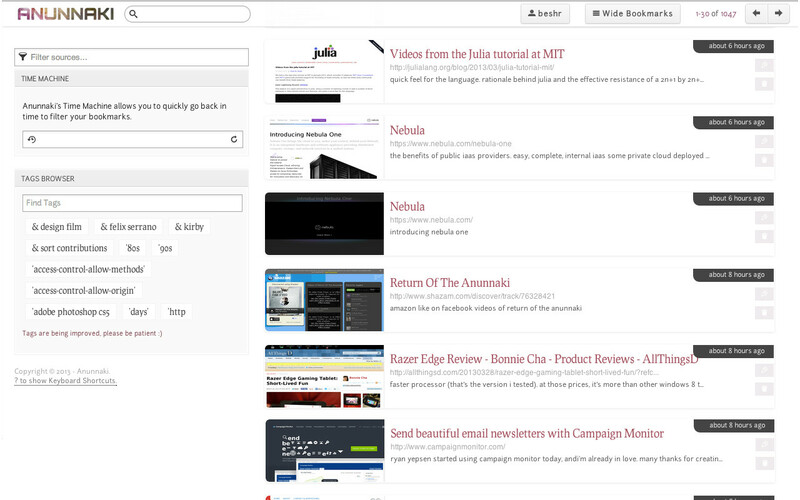 Gmail-like dashboard with keyboard shortcuts, wide-screenshots, automatically generated tags, and filter options allowing users to drill down and browse their bookmarks. You can find a more detailed list of features here: http://anunnaki.me/features/. Sing up here or just email me at me[at]beshr[dot]com. I'm currently in the process of writing a Django project that relies heavily on AngularJS. I haven't found many tutorials on tips on how to take on such a task, but I haven't had any problems so far, at least until I wanted my URL Patterns in Django to work nicely with Angular's Routes. The main problem with this task specifically is that both Django and Angular provide their own way of working with URLs. You'll need to satisfy Django's URL/View patterns if you're planning on having any server side logic controlled by your views, even if it's only to provide some data from your db. But you might also want to enjoy the greatness of Angular's routes, and partial HTMLs that are loaded instantly, something like Asynchronous HTML and HTTP but with real permanent links and working back button. Note: You might want to take a look at django-pjax to get similar features only with jQuery. So, here's the way I did it. This is basically the code code I'm using for Angular's $routeProvider. Before I go through each one of these routes individually, take a look at the code I'm using in django's URLs.py for the urlpatterns. As you can notice, I'm using quite a few tricks to make this happen. The 2nd and 3rd URL Patterns are also templates that Angular is using to satisfy the 1st and the 4th routes, but each one has got it's own view function because each one needs some data from database and some backend processing. The idea of the first one (views/main.html) for example is that it's loading latest posts from the db, figuring out some info about the user logged in, comments, etc..
What this is essentially doing is that it's loading "views/post.html?id=postid" and passing it through Django behind the scenes, thus allowing the view function postview to do what ever it wants with the content and pass it to the actual post.html template rendering all of its django template language and loading the content according, then pass it again to Angular to view it in the assigned ng-view block. I've tested this and worked pretty much exactly the way I wanted it to. If you've spotted anything wrong, or if you're doing it differently, please do share in the comments! This is an op-ed I wrote for Syria Deeply that appeared on December 6th, 2012. Whether one is a supporter of the opposition, the regime, or the people, we all recognize that Syria is on the verge of a drastic change. This change extends beyond the political upheaval we’re experiencing today. It is shaping a new level of civic participation among Syrian youth. As with other uprisings across the region, “social media” became a prominent medium in the Syrian conflict. The buzz was sometimes too much to bear, considering how quickly these mediums could spread incorrect information. Still, it’s valuable to note that Syrian youth is using these tools to spread information beyond real-time news. Towns and cities are being destroyed, and basic logistics—such as trash pick-up—are no longer viable. Those Syrians not dying from bombs are struggling just to live. Social networks have become a way to raise awareness of the difficulties affecting people on a daily basis. Damascus Civil Emergency Broadcast is one of these campaigns. The Facebook page started on July 19th of this year and has around 2,775 likes so far. According to the page, the owners support neither “the revolution” nor “the system”; instead, they support “jasmine” and “loaves of bread”. The page publishes tips on how to survive the disaster in Syria on a regular basis. From cautionary advice on how to protect oneself from mortar shells, and tips on how to avoid fire shots, snipers, bomb shards, splinters, or fragmentations, to how to deal with wounded civilians in the state of shock, and ideas on how to keep oneself composed during stressful times. Other campaigns are responding to emerging situations. For example, due to the lack of security, kidnappings from both sides have increased. Project: Safety prepared a documentexplaining how to deal with these kidnappings, from negotiating on the phone to the actual delivery process. Another guide to survival was prepared by Freedom Days, a campaign that claims to promote peaceful civil resistance. This document explains the harmful effects of constant exposure to violent execution scenes, dead bodies, and the aftermath of bombings or massacres, which are usually uncensored on sources like YouTube. Many more campaigns exist on Facebook, trying to help Syrians survive through this—what seems like—never-ending conflict. Speculating the future of Syria is difficult, but these online campaigns are offering a new hope: they are preparing Syrians for heightened civic engagement. They are putting people before politics. These online campaigns may seem small, but they have the potential to counteract the negative forces that drag the Syrian community to isolation. When a new Syria emerges, it will be with a strong civic ethos. Beshr is a software developer based in Beirut. He founded TweetWeekSyria, a localization of the Curators of Sweden project based on the concept of #RotationCuration. He's passionate about open source, algorithms, and indie music." There's nothing much to say here really. I extracted the Hyde theme I created for my site (was using it before switching to Ghost) and published it on github. My intention was to design a clean, readable and responsive theme to replace my tumblr. I really liked Hyde because of its simplicity and cleanliness. I've always been a big fan of indie games and the indie game making culture, this increased tremendously after watching Inde Game the Movie. Simple, yet challenging gameplay was the goal, so I came up with the concept of Save the Pixels. You can read a review about it on the Indie Games Weblog or watch the game play demo on YouTube. You can download the game from http://beshr.com/stp.